The United States Supreme Court will hear two cases involving banks and homeowners with underwater mortgages. The cases are Bank of America v. Caulkett and Bank of America v. Toledo-Cardona. An underwater mortgage is a loan for the purchase of a home with a higher balance than the fair-market value of the home. The Court will decide whether a Chapter 7 debtor may void a second mortgage when a home’s current value has dropped below the amount owed on the first mortgage. One of the parties to the case, Bank of America, argued that the avoiding process is conflicting among the circuit courts that have considered the issue. For the past four decades, only a few circuits have heard an argument on the question presented. The Supreme Court will most likely hear arguments in the Spring. This case should resolve the conflicting opinions. 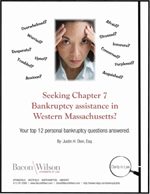 For more information, contact bankruptcy counsel. No one is immune to bankruptcy – it can affect anyone, including celebrities. In fact, a startling number of the “rich and famous” have filed for bankruptcy for relief from their debts. There are many reasons why someone famous might file for bankruptcy, including overspending, divorce, legal issues, contract disputes, bad investments, and declining income due to the fading of their celebrity “star power.” In some cases, celebrities delegate financial management and tax preparation to advisors or investors who may prove to be inept or even criminal, leading otherwise financially solvent people into insolvency. Additionally, many people, including celebrities, do not have the ability to spend less than they earn, or are naïve about how to cope with a sudden increase in wealth. For example, since 2006, when the Bravo Network first began airing the “Real Housewives” series, at least six of the sixty-seven cast members (9%) have filed for bankruptcy. Actors: Burt Reynolds, Terri Polo, Sherman Hemsley, Gary Busey, Drake Bell, Lorraine Bracco, Stephen Baldwin, and Kim Basinger. Popular Musicians: Toni Braxton, Anita Bryant, Stanley Burrell (aka “MC Hammer”), Aaron Carter, Natalie Cole, Mick Fleetwood, Ronald Isley, Jerry Lee Lewis, Vince Neil, Dionne Warwick, Earl Simmons (aka “DMX”), David Crosby, and Tionne Watkins (also known as TLC’s “T-Boz”). Country Musicians: Merle Haggard, Mindy McCready, Tammy Wynette, Eddie Mongomery, and David Allan Coe. Other notable names: David Adkins (aka “Sinbad”), Janice Dickinson (self-proclaimed “First Supermodel), Arsenio Hall, Vickie Lynn Hogan (better known as Anna Nicole Smith) and Suge Knight. After being criminally acquitted for the murder of her daughter in 2011, Casey Anthony also filed for bankruptcy. Given the subjective definition of who would be considered to be a “celebrity,” it is difficult to determine the exact number of celebrities who have filed for bankruptcy. The aforementioned listing of celebrities is therefore not exhaustive. For more information about financial affairs and legal matters, contact skilled and experienced bankruptcy counsel. U.S. District Court Judge Esther Salas sentenced Real Housewives of New Jersey star Teresa Giudice to 15 months in federal prison, after giving her husband, Joe Giudice, a sentence of 41 months. The couple will be allowed to serve time separately so that one of them will be home with their four young daughters. The Judge also ordered that Mr. Giudice be fined $10,000, and that they both pay restitution of $414,588 for illegally obtained loans. The Giudices pled guilty earlier this year to three counts of bankruptcy fraud as well as one count of mail and wire fraud conspiracy. The couple illegally obtained millions of dollars in loans and hid income and assets in their 2009 Chapter 7 bankruptcy filing. In 2004, Mr. Giudice also pled guilty for failing to file his 2004 tax return. The trouble for the Giudice couple began when they declared bankruptcy, citing millions of dollars of debt. When Mr. Giudice invoked his Fifth Amendment right against self-incrimination after being questioned about his assets and income by his assigned Chapter 7 Bankruptcy Trustee, the situation worsened. The Trustee made a criminal referral to the Justice Department, which oversees bankruptcy matters with the Office of the US Trustee, and eventually indictments were issued and the criminal prosecutions followed. The ruling of Judge Salas leaves the Giudices responsible for all of their own debts, due to the denial of their Bankruptcy Discharge. Their debt is now approximately $13,500,000. Assets they still have include their New Jersey mansion worth $3.99 million, a home on the Jersey shore worth $315,000, and a rental property worth $179,000. In addition, they also owe money to credit card companies, contractors, the IRS, multiple banks, and creditors. The moral of this “Real” story: Always tell the truth to your Bankruptcy Trustee. For more information about this or any other bankruptcy related matters, be sure to consult with skilled Bankruptcy counsel. Because he failed to tell the truth in his bankruptcy proceedings, a debtor named Jay Freese of Montour, Iowa, will now have a long time to rethink his decision to deceive the US Bankruptcy Court, as he departs to serve time in federal prison. Mr. Freese filed personal bankruptcy in 2009. However, in his case, he failed to disclose that he owned both a skid loader and a tractor, even when questioned under oath by the Bankruptcy Judge. Mr. Freese claimed that he had sold both items to another person. He later pled guilty to one count of concealing assets in a bankruptcy. He was recently sentenced to 18 months in prison and given a $5,000.00 fine. The moral of this tale is “do not lie to any judge,” especially a Federal Bankruptcy Court judge. If you are contemplating bankruptcy or any other legal proceeding, or being asked to testify in a court proceeding, first contact experienced legal counsel. Judge Michael Kaplan of the United States Bankruptcy Court in Newark, New Jersey, recently approved the sale of Crumbs Bake Shop, Inc. to Dippin’ Dots owner Fischer Enterprises and its partner, TV star and financial investor Marcus Lemonis. The new owners will take over Crumbs in exchange for the cancellation of approximately $6.5 million in debt. As a result, the Crumbs chain will be expanded beyond its signature cupcakes. Crumbs, founded by husband and wife, Jason and Mia Bauer in 2003, took off with its first retail store on New York City’s Upper West Side. The company became known for its four-inch, frosting-topped cupcakes in flavors such as cookie dough, caramel macchiato, and red velvet, usually costing between $3.50 and $4.50 each. After a sale to new corporate owners and a rapid expansion to the number of its retail locations in many States, the company went public in 2011. After several years of losses, a dwindling cash supply, and a food craze that began to wane in the face of many imitators and the loss of its initial excitement, the financial outlook looked dreary for Crumbs. When it entered into bankruptcy, Crumbs searched for a buyer. There was interest expressed by thirteen potential purchasers in the Bankruptcy process, but only the Fischer-Lemonis group put in a formal offer. Crumbs planned to hold an auction, but it was cancelled for a lack of interest. Many of the Crumbs’ Northeast locations will remain closed because the company will focus instead on about two dozen locations in New York, Los Angeles, Chicago, Boston, and Washington, D.C. The new Crumbs stores will continue to sell its famous cupcakes, but will now also incorporate the sale of other food brands, including Dippin’ Dots ice cream treats and other food products, some of which are associated with products sold by the new owners. “The court is pleased to see there will be employees going back to work, and that there will be certain landlords with continuing tenants,” said Judge Kaplan, after granting the approval, ending the company’s Chapter 11 bankruptcy case. Unfortunately, many of the former landlords and general unsecured creditors will suffer a financial loss from the Crumbs bankruptcy, but that’s the way the cupcake crumbles.